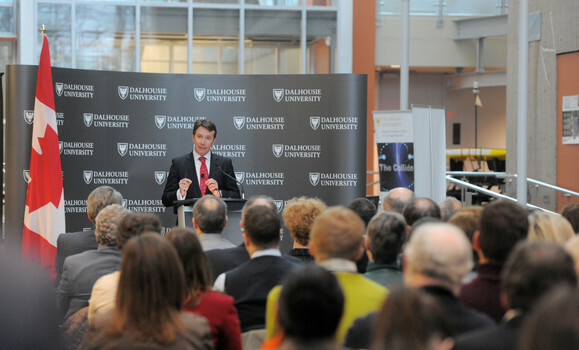 One of the federal government’s top economic officials arrived at Dal Wednesday morning to answer questions from students, staff and faculty about the new federal budget. 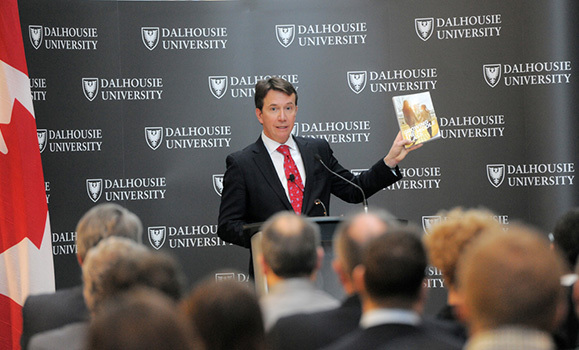 The Honourable Scott Brison, president of the Treasury Board and a Dal alumnus, was on campus to discuss details of the Liberal government’s first budget, released Tuesday. The budget includes several new investments aimed at helping universities and colleges play a bigger part in driving global competitiveness for the Canadian economy. Students, faculty, and others sat and stood in the atrium of the Steele Ocean Sciences Building to listen to and participate in a discussion forum with Brison. He kicked off his appearance with remarks on a variety of topics, including how the budget will help support new research discoveries and opportunities for students at post-secondary institutions. Brison pointed to a new $2-billion infrastructure investment fund being created to help universities and colleges modernize on-campus research, commercialization and training facilities over the next three years. "This is critically important to the future of the Canadian economy because there is no area of investment that's more important to creating the jobs of tomorrow than the direct investments we make in research and development capacity at Canadian universities," said Brison of the fund, $500 million of which will flow out to institutions over the next year. Brison said universities in Nova Scotia are particularly well-placed to contribute in globally important areas such sustainable aquaculture and ocean research, noting the latter would be a key focus for the government as it rolls out its infrastructure investment program. The budget also contains the largest increase in annual funding for research in more than a decade, with Canada’s top research granting councils receiving an additional $95 million per year, starting immediately. 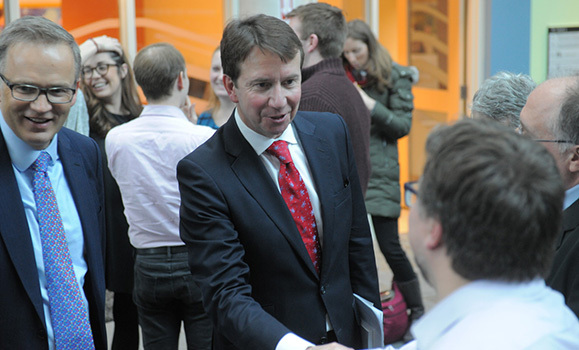 Brison, a long-time Member of Parliament for Nova Scotia’s Kings-Hants riding, said one of this province’s great economic advantages is its network of universities and their research potential. "We recognize that as a government, and that's why we are investing in Canadian universities and in our research capacity," he said. Brison also highlighted investments in the budget aimed at helping students and other young people, including a significant increase in grants to low- and middle-income students across the country by as much as a $1,000 a year. He said the measure would help over 360,000 Canadian students. Following his prepared remarks, Brison took questions from those in attendance on a range of issues — from new education funding for First Nations individuals to the importance of immigrant entrepreneurs to the regional and national economy. “We view immigration as a source of economic growth for all Canadians and for all Atlantic Canadians, and when you talk about the demographic challenge we face there is no area of public policy more important to that than immigration,” said Brison, noting that just last week the government created a new advisory council aimed at helping attract more new immigrants to the region. Brison also had a chance to learn about some of the entrepreneurial activity happening at Dal. Following the Q&A, he took part in a showcase of some of the student projects from the three Dal-hosted innovation sandboxes and the Launch Dal entrepreneurship programming. Holly Fisher, a third-year Animal Science student who takes part in the Cultiv8 innovation sandbox on the Agricultural Campus, was on-hand to discuss her research on the nutritional characteristics of mealworms, the larval form of the mealworm beetle. When exposed to low levels of insecticide, they have the potential to be a reliable and cost-efficient source of protein. Fisher offered Brison a chocolate chip cookie she had baked using flour derived from mealworms, which he ate as he learned more about her project. News of the new support for research was a treat of its own for Fisher, who said she was thrilled to hear the details of the government’s plan and its support for research and innovation such as hers. “It was fantastic to hear that somebody in government was actually on board with this,” she said.